So dragon vale is not letting me give friends any gifts…anyone else experiencing this? This is late, but garland dragon+cotton dragon will get you one. I also breeded one one hour after the event ended with double leap year+muse dragon. Hey doc, whats the pair that you used to get this combo? Second try came up with something different. 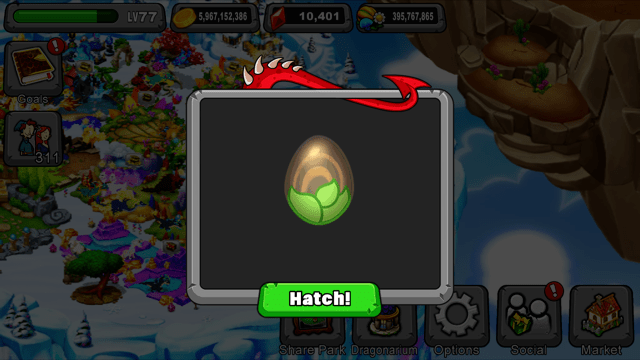 Just bred one on like the 5th or 6th try with lvl 16 Arbor & Bluefire dragons on the EBS. I was trying for Paper with Mountain and Poison (both level 16’s in regular breeding cave), but, “Surprise!”, I got Wyrmwood. Hope that combo helps someone. Thanks. Unfortunately, I used the same 2 for paper, and it didn’t work the 9 times I tried(would’ve tried more, but they only had given 24 hours to breed paper.) All I kept getting were flower and poison. And my dragons were levels 16 and 14! I leveled up a few times with poison, and still it didn’t work. The only luck I’ve had, thus far, was btwn 6 and 7pm EST, on Fri. and Sat. (Got platinum and lunar ecliose) Yet, again, everything is random, so that probably won’t help anyone. Lol This game is driving me crazy with the randomness and waiting times! This is off topic. I noticed a way to create a new park. Does this mean I can have two parks or will I lose my original park? I have been trying all 3 breeding spots with no luck. I have Moss+ Blue Fire; Flower+Mountain; Obsidian+Evergreen. All are level 16. What is happening? Why can’t I get one? I got nothing at all during the anniversary event either. Someone help!